Because my cabinets are still mostly a warm wood color, I left the handles in a natural wood, and restained them to be the same as the cabinet color. 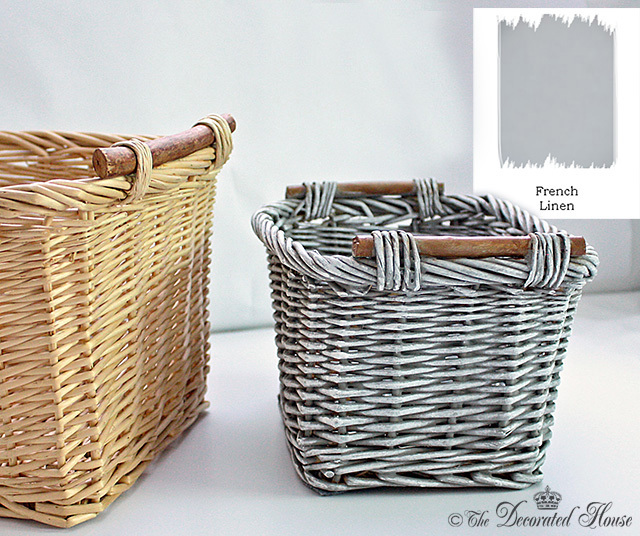 Here are the steps to get this look: Skip steps 1 & 2 if your basket is clean and ready to paint. 1. Clean your basket if you need to with a simple warm soapy water solution, being careful not to over wet the basket or you will need to let it dry again completely. Mine were clean, so there was no need for this step. 2. If your basket is very dark and you are going very light, you may need a primer so that the basket color or stain will not keep bleeding through your paint. These baskets were light in color and I am painting them gray, so this step was not needed. 3. For this project I painted the baskets with Annie Sloan Chalk Paint. For that reason, there was no need to prime the surface. It did however take a couple of light coats to get the right coverage. Paint the entire basket inside and out with a brush, or you can use a spray paint. 4. Let your basket dry completely. If you would like your basket to have an "aged" look you can make a simple glaze using a watered down acrylic brown paint, or gray for a white basket will work as well. Choices for paint colors for the brown would be raw umber or burnt umber, with the burnt having more red in it. 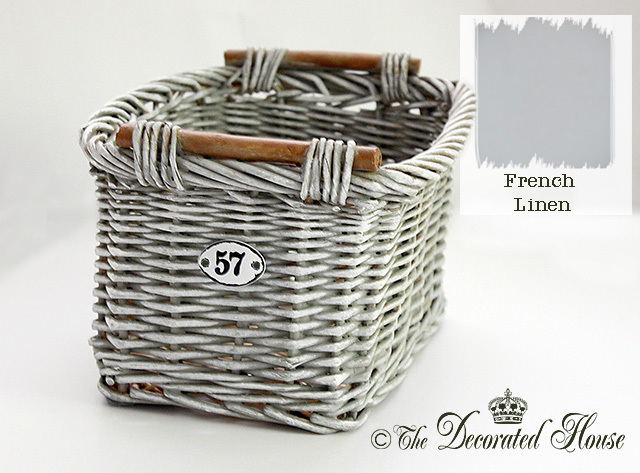 And on a white or off white basket, you can use a medium to dark gray for a different kind of aged look. 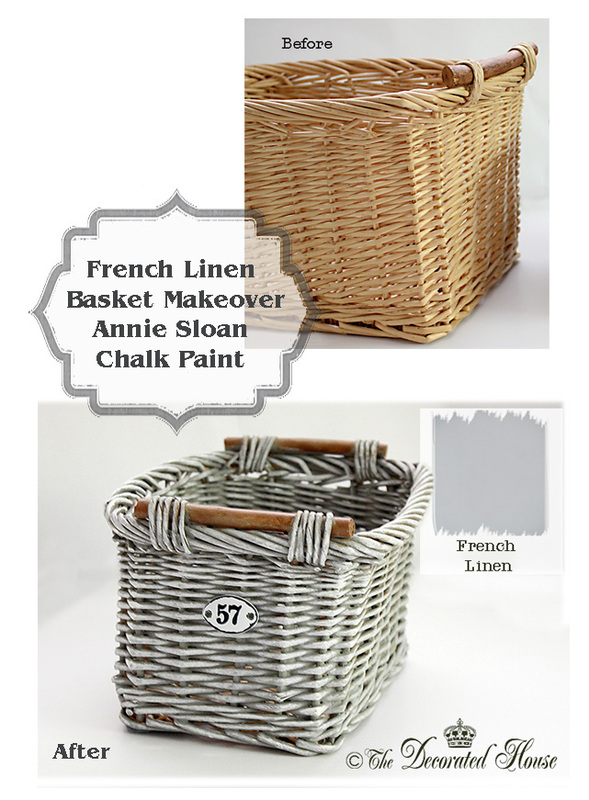 The basket above was "dry brushed" with Annie Sloan Chalk Paint in Old White. You can use any white paint. If it is too white, add a bit of beige, or gray to it. Add a small amount at a time, it can change white more than you might want. Do not dilute the paint. Start with a dry, flat brush, or a small sponge brush, load a small amount of white paint on the bottom part of the bristles.Wipe off the excess paint on a dry paper towel so that the paint is evenly distributed on the bottom of the brush. You don't want any clumps of paint in one area on the tip of the brush or you will get an uneven brushing or clumping in spots. This is the "dry brush" part, meaning that the brush starts dry and has a small amount paint on it. Keep the brush a bit horizontal across the surface of the basket, only touching the highest areas at first, and not getting any paint into the recessed areas. Don't try to do it all in one coat if the color is still showing more than you wish. With the next layers you can decide how much white you want to show, and how much of the gray, by doing as many or as few layers as you want. It is much better to go over whatever item you are painting with more coats of dry brushing to get exactly the look you want than it is to go too heavy with the first coat. Remember is is easier to add paint and dry brushing if you want more than it is to remove it once the paint is on there. One more little project done on a very long list of little things to do to get the kitchen done! Donna this basket turned our fantastic. I love the texture they add to a room. I agree with you all, the color is very pretty! It is a different shade of gray than we see more often, but it is a wonderful color. The basket is gorgeous Donna and I love the color you selected. Love this Donna! Such a simple yet lovely transformation. Great idea and a must try. I just love this transformation so plan to do a couple baskets. Can you please tell us where you found the oval numbers?? They just "finish" the basket so nicely. Thanks so much!! The metal numbers were purchased in the scrapbooking section of Joann's. I don't see them on line from there, but they might have it in the stores. It is "Tim Holtz Ideology Plaquettes" They were about $7.50 for a package of 9. There just happens to be a package on ebay for $4 and one on etsy for $5, plus shipping with each of them. Just put in the name in either search and you can find them on either site.